DLR wins the big Mexican Open draw. 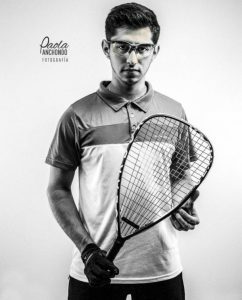 Congrats to Daniel De La Rosa his win in the big Men’s draw this past weekend in Monterrey, NL, Mexico, taking down a who’s-who of Mexico racquetball players to win the 2018 Mexican Open. In case you missed any of the matches, marquee matches were streamed live by RKT and were well covered in the Streaming Racquet sports facebook group. – Gerardo Franco Gonzalez blasted IRT #5 ranked Sebastian Franco 9,5. That was a long flight for a one-and-done for S.Franco, and is a very solid win for Gerardo. – Daniel De La Rosa (DLR) played a closer-than-expected match against #31 seed Jordy Alonso winning 11,13. – Juan Loreto made his opener with Polito Gutierrez a little closer than I would have expected, losing 9,11. – Erick Cuevas eked out an 11-9 tiebreaker win over Daniel Neri in the 15/18 match-up. – … But the big upset was Javier Estrada taking out IRT #6 Alvaro Beltran in a tiebreaker. Not an upset by seeding, but certainly a very solid win for Estrada. Beltran looked sluggish on the court … almost as if he was a 40-yr old who in the last 5 days has had to play an hour and a half final against the best player in the world, fly home, rest a day, fly to Monterrey and then play a match against a red-hot Estrada. Lets see if Estrada can build on this win and make a run. – #1 Rodrigo Montoya Solis played a close one against Alejandro Alex Cardona fighting off a furious 2nd game comeback to advance 11,14. – #5 Javier Mar took out the veteran Polo Gutierrez 9,10 by playing an aggressive match and turning up the pressure on his opponent. – #13 Alejandro Alex Landa “upset” #4 seed Alan Natera Chavez 14,3. In the first, Landa stormed back after Natera jumped out to a big lead … then just rolled in the second game, consistently sending Natera the wrong way on serves and just controlling the match. – #3 Andree Parrilla ended Gerardo Franco’s upset run 3,12. – #11 Christian Longoria got a solid win over #6 Estrada in a tiebreaker. One of Longoria’s best career wins for me. – #7 Sebastian Fernandez controlled Edson Martinez for a comfortable 2 game win. – #2 DLR advanced with ease over Erick Cuevas 4,5. So 5 of top 8 seeds advance into the quarters. – Montoya handled Portillo, though Lalo certainly improved his performance over the last time they played, going down 7,11. Portillo has made great strides in his game over the past calendar year and could be a force on the pro tours quite soon. – In the Match of the quarters, two of the worlds best went head to head, with Landa taking out Mar 3,(12),2. Landa dominated the first game with his classical pressure game; he relentlessly drive serves, often puts his opponents in positions where they have to take defensive shots, and is a world-class shot maker/kill shot artist from any point in the court. Mar turned the tables by winning a close one in the second, but Landa turned back up the pressure and ran away with the tiebreaker. In my prediction piece I thought perhaps Landa would get upset here, but he’s playing with a spring in his step that you don’t often see. I think he’s motivated and a threat to win this draw now that he’s gotten past two dangerous opponents. – Parrilla cruised past Longoria 8,12. Parrilla is a sneaky opponent; he adapts to any playing stile, is a world-class retreiver, and is in good enough shape to outlast most any opponent. He’s still a little inconsistent (he’s had some upsets early in amateur events of late) and got a little unlucky in the Portland draw (having to face Kane in the 16s), but I think he’s headed towards a top 8 IRT season. – DLR blasted newly matriculated junior Sebastian Fernandez 5,3. Both these guys have similar playing styles, and can look quite “casual” with their serves and demeanor on the court. Fernandez stepped it up, especially at the US Open in October, but clearly has a ways to go to compete with his country’s best. Its notable that the last 8 of this event included both kids who made the 18U national and junior worlds finals this year; both Portillo and Fernandez seems well equipped to compete with the adults going forward. In the Semis, we saw just how great top-level racquetball can be, with two fantastic matches that include (for me) the four best players in the world behind Kane and Rocky. – Montoya and Landa played a scintillating match, with Montoya edging Landa 15-14 in the first game fittingly on a blistering killshot from deep in the court. Landa jumped way ahead in game 2, leading 10-3 at one point … then Montoya took over, scoring 12 unanswered points to take the match 14,10. Landa and Montoya have now split 4 head-to-head matches in big-time events over the past couple of seasons and the margin between them is razor thin. – DLR and Parrilla were one point away from the “perfect match,” splitting two games 15-14 before DLR took the tiebreaker 11-9. Parrilla took a slight knock at 8-7 in the breaker, took a few minutes injury time, then traded clutch shots at match point for and against before DLR got a service winner to take the match. In the final…DLR played a complete game and really shut down Montoya, winning 8.8. DLR was his same consistent self, with a controlled game plan, while Montoya’s game seemed a bit off and that was enough to make for a not-very-close final. – Landa/Gutierrez downed Cardona/GFranco, who were the beneficiaries of the forfeit loss of the top team. They were made to work for it though, winning two close games 13 and 14. – Mar/Montoya faced Parrilla/Edson Martinez and also advanced in two closer games 13,11. In the final, Mar/Montoya run away with the first game 15-3, and held on the second to win in two. Also, congrats to Paola Longoria for taking the small Women’s draw over three of her LPRT top 10 compatriots. In the semis, Longoria put a dominating win on the current 18U Junior World champ Montse Mejia 7,2, while Alexandra Herrera overcame a first game loss to donut Nancy Enriquez in the second and then take the tiebreaker 11-5. In the Final, Longoria ran away from Herrera by the same scores that she downed Montserrat by: 7 and 2. Summary of the event: a fantastic inaugural event if it becomes a regular fixture on the circuit. You couldn’t ask for much more in terms of domestic talent. I’d have loved to see the rest of the top IRT touring players there; imagine a 50 person pro draw with the breadth of the IRT players showing up and making every round of 16 match even more competitive. Hope to see more from RKT going forward. There’s a break in the pro schedule this weekend. That wasn’t always meant to be the case, as this weekend’s huge tournament in San Nicholas (Monterrey), Mexico was initially scheduled to be an IRT event. The RKT/Federación Mexicana de Raquetbol and the IRT parted organizational ways … but the event is still huge. There’s a 32-man Open draw that’s a literally who’s who of Mexican racquetball today. Just about the only top Mexican players I don’t see here is Ernesto Ochoa, who’s been red-hot this year with a bunch of good wins, and the Garay brothers. First, a comment on the seeding. Much like the IRT has to go with its ranking system to seed tournaments, the RKT/FMR is clearly using its own internal country ranking system to seed this event. The top 2 seeds are also the finalists from the Worlds selection event in June, and the rest of the top 8 seems to be drawn from either that event or Mexican Nationals from February. That means that current IRT #1 Alex Landa is seeded a ridiculous #13, and the finalist from last weekend’s IRT event Alvaro Beltran is an even more ridiculous #27. But it also means we have pretty compelling matches from the round of 32 on-wards. – Polo Polito Gutierrez goes against Juan Loreto. Gutierrez in his prime was one of the most dangerous players in the world, routinely making waves in the few IRT events he entered. He’s back from an elbow injury and is always a threat to advance deep into a draw. – Sebastian Franco versus Gerardo Franco Gonzalez; they’ve met four times in pro events that I track so they have some familiarity. Franco is in-arguably a top 8 player in the world, won an IRT event last year .. and is the #19 seed here. Tough draw for Gerardo Franco in the opener. – Beltran versus Javier Estrada; easily the best match of the first round. Estrada made semis of Mexican Nationals in 2017, beat Landa in Worlds selection event in 2018, played Montoya tough the last couple times they’ve played .. he’s a darn good player. Despite the star power, this would not be a huge upset if Estrada beats Beltran here. Unfortunately this is a quarters match, not a round of 32. I’ll give it to Beltran, given how he played last weekend in Portland. – Daniel Neri vs Erick Cuevas Fernandez; 15/18 match-ups are always fun and this one could be tight. I’ll give the slight nod to Neri. – Daniel De La Rosa goes up against Jordy Alonso in the opener, a tough draw for Mr. Alonso. – #1 Rodrigo Montoya Solis vs #16 Alex Cardona; this is a semis or finals on the WRT but the round of 16 here. Cardona leads h2h 4-2 but they havn’t met in a year. The current World champ Montoya should advance here based on form but i’m sure he’d have hoped for an easier early round match than this. – #8 Jaime Martell Neri vs #9 Eduardo Lalo Portillo; a fun match between the current world 18U junior champ Portillo and one of the top ranked WRT players who has a WRT win on his 2018 resume. Portillo has the chops to win this match, having taken out top WRT pros in the past. Martell has been playing solid in non-pro events lately, making the finals in San Antonio last weekend. I’ll go with the youngster in a tie-breaker. – #4 Alan Natera Chavez vs #13 Landa: man, tough match-up for Natera, coming off a nice win in San Antonio last weekend but having to face up against the current #1 ranked player in the world. Natera has literally never played an IRT event, but does have some WRT history and made the semis of Mexican Nationals in February. Landa has had some puzzling losses in big-time Mexican events lately (he lost in the 16s at both Mexican Nats and the Worlds selection event this year) but should win here. – #3 Andree Parrilla vs Sebastian Franco: they have a couple of meetings h2h but they’re from several years ago. In the meantime, both have become first-time IRT winners. Andree Parrilla has been up and down lately; making the semis of the US Open but then getting upset early at SLP Open in November. I favor Parrilla. – #6 Estrada/Beltran winner vs Christian Longoria; I think Longoria is an underdog to either player advancing here. – #7 Sebastian Fernandez versus #10 Edson Martinez; Fernandez was the world junior 18U runner up, capping off a decorated juniors career both domestically and internationally. He also has had a number of sterling wins on both pro tours and is favored here against the mercurial Martinez. – #2 DLR vs Neri: DLR, unlike a lot of his top-ranked compatriots, gets no surprises in either the 32s or the 16s. Projecting the Quarters. I’ll be the first to admit that the above projections may be totally wrong. Mexican events tend to have upsets, crazy upsets. So take the following with a grain of salt. – #1 Montoya vs #9 Portillo: a meeting of the current reigning World Adult and World Junior champs could await. These two met a few weeks ago in the SLP open and Montoya won handily 2,2. I see another win here for the #1 seed. – #5 Mar vs #13 Landa: Mar-Landa would be fantastic if it comes to pass. These two met in the finals of the 2017 Mexican Nationals (won by Mar, though Landa then went and won the Pan American Championships later that summer). I like Mar here; he’s in good form and plays Landa well. However, it wouldn’t surprise me in the least if this was Natera vs Polo. Just a tough quarter. – #3 Parrilla vs Beltran: Parilla and Beltran have gone back and forth, last meeting in Sarasota in April. I think Parrilla takes this one. – #2 DLR vs #7 Sebastian Fernandez: They’ve met once, in Mexican nationals in February, a straight-forward DLR win. I like the way DLR is playing (despite his early loss to doubles-partner Beltran in Portland last weekend). DLR in 2. – Parrilla over DLR; they havn’t met in a while, but Parrilla has some wins over DLR in the past. Final: Montoya over Parrilla; these two have met a number of times over the years, in both juniors and adult competitions. They’re the same rball year, and met in Mexican junior finals in 16U and 18U. Montoya had the early upper-hand, and has taken their matchups as of late. It’d be a great final if it comes to pass, and i’d favor Montoya. Of course, if the semis were instead Montoya-Landa and DLR-Beltran, it could be a completely different final; I like Landa over Montoya and Beltran over DLR right now, and Landa taking it. These guys all play each other constantly, and there’s a lot of match-up based play. – 9-16: Natera, Estrada, Cardona, Martell, Gerardo Franco, Portillo, Sebastian Fernandez and Jordy Alonso. There is a small Ladies Open event coincidentally; four of the top Mexican women are present and face off in a simple single elimination draw. – LPRT #4 Alexandra Herrera faces LPRT #6 Nancy Enriquez. I’ll go with Longoria and Herrera in the final with a Paola win. Enjoy the matches! Follow FMR and RKT for streaming, or join the Racquet streaming group that JT Rball does a great job of keeping up to date. Huczek continues to hold the record for most world Junior titles. When the International Racquetball Federation – IRF World Juniors event finished up in November, I took the opportunity to tackle some Juniors-focused data entry. Historically I have only pursued full match results for 16U and 18U juniors events only. 16U has been my “dividing line” for tracking match results, thinking that tracking younger kids match results was slighly unsavory. However, the winners of these tourneys become part of permanent racquetball history no matter what their age, and there’s value in having it all in one easy to consume report. We also have this same data completed for all of USA juniors history, dating to 1974. Canada is a work in progress; I’ve got limited data from 2013 on-wards online and need to do r2sports and archive.org work to build history. Mexico is in even worse shape, with online records in r2sports only to 2013 and the former Mexican federation website that would have held such data having been left to pasture at some point in the 2013 time-frame. As always with Amateur FMR data … any help is appreciated. One great side-effect of having this matrix is this: we can now get great trivia questions answered quickly! – Who holds the most Junior Worlds Boys titles? A tie between Jack Huczek and David Ortega, each of whom won 11 World Juniors titles. b is next, with 8. – Who won the most Junior Worlds Girls titles? Adrienne Fisher Haynes holds the record with 10 international titles; she missed out on an 11th by getting upset in her final 18U event by Samantha Salas in the 2004 world championships. Paola Longoria is 2nd with 8 junior world titles. – Both Sudsy Monchik and Rocky Carson won three successive 18U world junior titles. 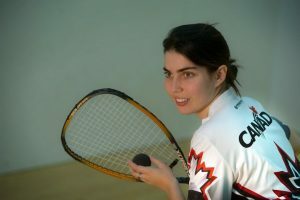 The only other player to hold 3 successive titles in any age bracket was Sudsy’s now wife Veronica Vero Sotomayor, who held the 12U title from 2003 to 2005. – American Erika Manilla had an interesting Junior Worlds career; she won 6U-multi bounce in 2005 … then didn’t win another World Junior title until her last eligible tourney, taking 18U in 2016. Natera with a solid win over several compatriots in San Antonio. A competing event to the IRT Portland event was the 2018 Alamo City Open in San Antonio, TX. Originally set to be an WRT event, this tourney and the WRT parted ways but it still featured a healthy purse. As such, it drew a few quality players to cross the border and compete. R2sports link for the pro singles draw is here. Here’s a quick review of the draws, singles and doubles. No surprises really in the round of 16s: all travelling Mexican players advanced, including the criminally under-seeded Alan Natera Chavez , who took out the #3 seeded Arturo Arturo-Cinthia Burruel 4,9. If you had asked me to seed this tourney looking at who was there, i would have gone Ochoa, Estrada, Martell, Natera, Fernandez, Mendoza, then the rest of the local players starting with Burruel and Smith. Its just tough on everyone to make two guys play in the 16s who should be meeting in the quarters. Anyway. In the quarters, the travelling contingent of Mexican talent vanquished all comers, with Martel, Estrada, Natera and Ochoa all advancing with ease. That’s when the matches of interest started. In the first semi…Jaime Jaime Martell Neri reversed a trend of late and beat Javier Estrada 14,6. In the bottom half, Natera also showed why form doesn’t always dictate results, beating the red-hot Ernesto Ochoa in a tiebreaker 13,(6),4. In the final, Natera held on a late rush to take game 1 15-11, then dominated the rest of the way, winning the title 11.4, Martel just had no answer for Natera’s excellent drive serve. Great local tourney, good talent for the locals. The top four Mexicans all combined to make for a great doubles final as well, with Natera/Martel combining to beat Ochoa/Estrada 11-10. 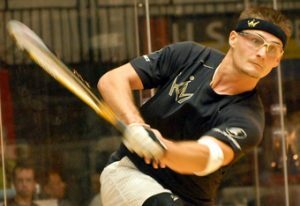 Congrats to Kane Waselenchuk on his win at the latest International Racquetball Tour pro stop. This represents Kane’s 112th career tourney win and extends his current on-court match winning streak to 70 (good for 3rd longest in history). Despite all the discussion on rankings from the week leading up to this event, Alejandro Landa will retain the #1 ranking for the time being (he did not play this event last year so had zero points to defend) and will hope for a better draw next time. Kane’s showing should improve his current ranking to #4 if I’m calculating the points correctly. The other two major points moves should involve Mario Mercado dropping out of the top 8 (he made the final of this event last year but got upset early in 2018), and Andree Parrilla moving INTO the top 8 despite his early upset to Kane since Andree did not play this event last season and only gains points. In the round of 64…no major upsets, but some tough tiebreakers. – #17 Thomas Carter outlasted Portland local Tim Prigo in a tie-breaker. – Tony Anthony Carson took out fellow Oregonian and podcast maven Dylan Reid 13,10. – #19 Nicholas Nick Riffel outlasted junior phenom Ricardo Ricky Diaz 11-8 in the breaker after dropping the first 15-14 then handing out a donut in the second. 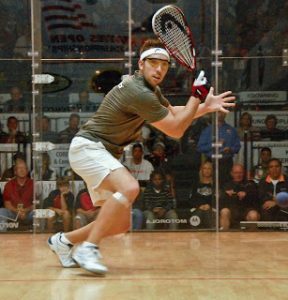 – Colombian international veteran Set Cubillos Ruiz outlasted tour ref Scott McClellan in a tough tiebreaker 11-8. – #15 Felipe Camacho was stretched to a tiebreaker by Oregon State Student Sam Bredenbeck. In the round of 32…we had some fireworks. – In what I think is a pretty significant upset, former IRT touring pro Carson took out #9 seed Andree Parrilla 7,12 to advance to the main draw. On the one hand, Carson has more than proven his ability to beat quality players; in this event last year he beat De La Rosa in the 16s and took the first two games off of Murray in the quarters before losing in 5. On the other hand, Parrilla made the semis of the US Open (vanquishing current #1 Landa along the way), had the match-winning point on his racquet before losing to Carson 11-10 in the quarters at Laurel, and has been roughly the 5th or 6th best player over the past calendar year results wise. I watched part of this match after the fact … and it was not as close as the scores suggest. Parrilla could do little with Carson’s drive serve, and I saw a lot of 3-point rallies with Parrilla flailing. Andree took a curiously early loss last weekend at the SLP Open, so it could definitely be a slight end of year down-turn in form for him (I recall something similar happening a couple years back; he suffered from some serious burn out playing both a full WRT schedule, part IRT schedule plus local events in Mexico), but with fewer IRT events on the schedule every event counts. – Defending champ and #13 seed Charlie Pratt eased past his junior team member Mauro Mauro Daniel Rojas to advance to the main draw. – #14 seed Adam Manilla took out his buddy Riffel to advance to the main draw. – #10 Jansen Allen took a close game one 15-14 over reigning outdoor champ Nick Montalbano and then cruised to the win. – #18 Robert Collins took a tightly-contested match over #15 Camacho in the tie-breaker to advance to his first main draw since March. – #1 seed Alex Landa cruised past Jake Bredenbeck 6,12. – #8 Kane Waselenchuk took out home-town favorite and upset minded Tony Carson 11,4. – #12 and #13 seeded Bobby David Horn and Charlie Pratt took out higher seeded players Mario Mercado and Sebastian Franco respectively. Upsets by seed, but not by expectations. – #14 Adam Manilla continued his impressive run of form, taking #3 seed Daniel de La Rosa to a tiebreaker. – #7 Samuel Murray left nothing in doubt and beat #10 Jansen Allen handily for his first win in their h2h meetings. – #2 Rocky Carson was stretched to a tiebreaker by #18 Collins in their first-ever top-level meeting. Excellent showing by Collins, who was looking for his second career quarter-final. – Waselenchuk took out #1 seed Landa 9,8 in a streaky match that probably wasn’t as close as the scores indicated. Landa kept it close-ish for the early parts of both games, but (in a similar pattern to the last couple of times they’ve played), Kane dominated the end-game in both games. – Pratt committed “coach on coach” crime and took out Horn in two close games 10,14. Despite the win, Pratt stands to take a tumble in the rankings because he’ll lose a significant chunk of the points he won at this event last year unless he manages to win again. – Beltran completely dominated his doubles partner DLR and advanced 8,8. This is his best result since April and should help kick start the slow start to his season. – Carson controlled Murray with ease 4,10 for his 7th win in 7 times against the Canadian national champ. This left the tournament definitely trending to the “veteran” status. Kane, Alvaro, Rocky and Charlie basically are the four oldest players on tour, at ages 37, 40, 39 and 32 respectively. In the Semis…Alvaro Beltran upset #2 Rocky Carson in an argumentative tie-breaker (neither player was terribly happy with the refereeing), while Kane blasted defending champ Pratt 3,5. In the Final, Kane took the match in two games 6,12 … but the 15-12 game was an hour+ tactical marathon where Beltran held out with excellent play and really made Kane work for the win. Next up for the IRT is the ever popular Coast to Coast open in Canoga Park, one of the biggest draws of the year. Pratt returns to the scene of his career accomplishment. We’re back! The International Racquetball Tour returns to action this coming weekend, returning to Portland and the legendary Multnomah Athletic Club for the 3rd event of the season; the SPC John A. Pelham Memorial Tournament of Champions for 2018. The r2sports home page for the event is http://www.r2sports.com/website/event-website.asp?TID=29358 . The Men’s draw is available right now at IRT’s home page here: www.irt-tour.com. Being that its Portland, there’s a good Junior component involved with this event with High school brackets. No less than 220 players are entered overall, and the pro draw has a healthy 36 players, including a ton of local players to the Northwest that we don’t normally see in national events. The top 18 players from the IRT tour rankings are present; only Gerardo Franco Gonzalez and Rodrigo Montoya Solis are missing from the top 20 players in the world current rankings. Lets review the draw. Here’s some interesting round of 64 qualifiers. I thought there were a bunch of compelling first rounders … many more so than normal. Should be a fun tourney. – #17 seed Thomas Carter vs Tim Prigo: Carter is one of the highest ranked tour vets to not get a bye into the 32s, and gets rewarded with a tough match against local player Prigo, who could upset him and move on. – Jake Bredenbeck vs Kadim Carrasco: the tour gets a rare appearance from the Bolivian Carrasco, an experienced IRT veteran but who had only appeared in US Opens previously. He’s a hard-hitter, which should make this match-up with fellow slugger Bredenbeck a fun one. Jake takes it and moves on. – Dylan Reid vs Tony Anthony Carson; an unfortunate match-up for both guys; they literally just played in a lower tier IRT event a few weeks back. Carson is a former full time IRT touring pro who finished in the top 10 four years running, with 3 career semi-finals appearances and is a tough draw for whoever he runs into. Reid is most famous in the rball community for his excellent Podcast series (check it out at this FB page: https://www.facebook.com/racquetballshow/ …. and as a disclaimer I was a guest this past summer talking stats and Kane’s then-retirement). Oh, as for the match, I think Carson takes it (sorry Dylan!) and moves on. 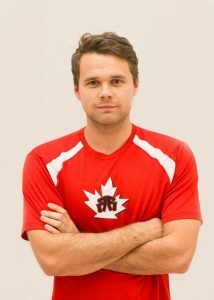 – Experienced Canadian international Tim Landeryou heads south of the border to take on IRT regular Justus Benson. A tough first round for the Texan, as Landeryou could give him trouble. – Ricardo Ricky Diaz vs Nick Riffel: another tough draw for touring regular Riffel; he faces off against the current 18U national champ Diaz. Could go either way. – The Ref Scott McClellan goes against long-time international Set Cubillos Ruiz in a tight first rounder. – #9 Andree Parrilla vs Tony Carson: Parrilla, in case you havn’t been paying attention, is on a tear. He’s 4th in season-to-date rankings and has made a ton of later rounds in events over the past season. Carson will be a tough match, expect a 3-game Parrilla win here. US Junior National team coach, goes against one of his team members in his attempt to defend his title. Not to mention the points that go with it; Pratt stands to plummet in the rankings after this weekend due to the expiration of his tourney win from last season and his part-time playing status. – Adam Manilla – Ricky Diaz: a nice match-up between two younger guys on tour. Manilla has been playing well lately, making the Quarters in Laurel with a couple of solid wins. – #10 seed Jansen Allen goes against New Yorker Nick Montalbano, who makes the cross-country flight for this event. None the less, its a really tough blow for current #1 player Alejandro Alex Landa , who has to face Kane in the quarters instead of the Finals. Fans get better matches earlier of course … but a situation like this does lend credence to the push for a slightly modified ranking system to account for this. It’s an even worse blow for #9 seeded Parrilla, who now faces an early exit at the hands of a player who he previously met in the finals of an IRT event. Off my soapbox, onto the preview. – #1 seed Alex Landa vs Bredenbeck: these two have met 6 times on the IRT and WRT, and Landa has won all 6 previously. He’ll look to make it 7 for 7 here. – #8 Kane Waselenchuk vs #9 Parrilla: Kane famously gave Andree a triple donut at the US Open a couple years back … then faced off against him in a final later that season where Parrilla played him pretty tough. You don’t predict against Kane these days … you just predict how close the match will be. Parrilla is a grinder, a tough player to play b/c he gets everything and doesn’t make mistakes. He’s also clever on the court and has the kind of off-speed serve that can do a decent job of forcing awkward shots out of Kane on the service return. Still, Kane advances. – #5 Mario Mercado vs #12 Bobby David Horn; despite the disparity in seeding, Horn has dominated their h2h meetings historically. He leads 6-1 h2h … So look for an upset here. – #4 Sebastian Franco vs #13 Pratt: again, don’t look at the rankings/seedings here. Pratt has never lost to Franco, and beat him in the semis of Worlds just this past August. Its Pratt’s home town; i expect him to advance here. – #3 Daniel de la Rosa vs #14 Manilla: Manilla has been playing well, but probably not well enough to down DLR. – #6 Alvaro Beltran vs #11 Jose Diaz: these two met in the 16s in Minneapolis in October too … with Diaz pulling out the upset. I think these two are heading in opposite directions and Diaz can win again. – #7 Samuel Murray vs #10 Jansen Allen: fresh off of his win at Canadian Nationals last week, Murray surprisingly has never beaten Allen in a top level match. Jansen’s now fallen to #10 in the rankings and may struggle to get back into the top 8; can he get another win over Murray to advance here? I’m giving the nod to Murray but wouldn’t be surprised by an upset. – #2 Rocky Carson vs Camacho: straight forward win for Carson here. – Kane over Landa: what should have been the final is instead a quarter. Last time they played, Landa played Kane tough, losing 11,9 in Canoga Park. Lets see how this one goes. – Pratt over Horn: this is a tough one to predict. Horn has beaten Pratt 2 of the 3 times they’ve played, including the last two. On a neutral court I think i pick Horn. But this is not a neutral court, and Horn has been scuffling lately with two early exits in the first two IRT events. Pratt advances. – DLR vs Diaz: they met in the quarters of the US Open in October, a 10,9 win for DLR. I sense the same would happen here. – Carson v Murray; They’ve met 6 times on the IRT, including the final of the Laurel season opener, and Rocky has won all 6 times. He makes it 7 for 7 here. – Kane over Pratt: Kane ends Pratt’s second straight attempt at a Cinderella run in Portland. – DLR over Rocky: a repeat of the US Open Semi, a tie-breaker win for DLR. Maybe this is the year DLR takes over #2 from Rocky after all these years (not that Landa wouldn’t have something to say about that). Project final: Kane over DLR, also a rematch from Minneapolis. Is the current ranking system unfair to Waselenchuk? On 11/20/18, the 12-month rolling IRT rankings shifted enough points away from last season to account for a pretty monumental set of movements in the rankings table: Alejandro Landa ascended to #1 for the first time ever, while the sports most dominant player Kane Waselenchuk fell to #6. 2. There was a sudden drop in the number of events in the first half of the 2018-19 season. When the IRT posted the update to facebook, A predictable firestorm of comments arose, criticizing the rankings and the ranking system. I weighed in, pondering initially why it mattered (other than tourney seeding of course) what the rankings were in November, but many believe a different ranking system is needed. Here are some Ranking system alternatives with some personal analysis. I tried to emulate all the solid suggestions on the facebook thread from various players and commenters. The working spreadsheet is available at Google Spreadsheets here. I’ll just list the top 10 players ranked though I extended the logic down to the top 20 running players or so throughout the last 2+ seasons. I have only included points earned in Tier 1s and Grand Slams. Some players (especially Landa and Parrilla) in reality have a decent amount more points thanks to success in non-Tier 1 events that still remain on their books. I have also only included the core point totals earned per tournament, not bothering to figure out the slight point additions based on games won for simplicity. In other words; if you made the semis I gave you 220 points though you may have lost the semis in a breaker and thus really earned 222 or 224 points. There’s a couple of players outside the top 10 with points discrepancies I cannot reconcile with this simplistic logic. Its likely also due to playing non-tier 1 events. In the grand scheme of this analysis though, it shouldn’t matter. Current Ranking System: utilizes a 12-month rolling calendar schedule that expires points the 366th day after the event occurs on an automatic basis. It also drops all low results to “baseline” the rankings at 9 events. More is available describing the logic at this IRT link and at the Current online rankings. Issue with this system: Kane is too low given he’s currently riding a 66 match winning streak, penalizes players too much for missing time with injury. So, the top of this table looks normal enough: Rocky Carson is above Kane, but Kane missed the first event of the year. Thanks to a hot start and a semis appearance at the US Open, Andree Parrilla is ranked 4th season-to-date. Alvaro Beltran, a mainstay in the top 10 for a decade, is nowhere to be seen (he missed the first event, and was upset early in the second event of the season). Landa drops to #5 here even though he has the most wins on tour outside of Kane in the last two years. Issue with this system: not enough data, too much recency bias. Alternative #2: Rank based just on last 9 events played. This system excludes any missed events and totals the points from the last 9 times the player got on the court. In some cases, we had to go back to the beginning of the 2016-17 season to get 9 events. This system obviously shows how dominant Kane is; by giving everyone the benefit of the doubt and removing all their missed events, all players are showing their absolute best possible results. Two notably high players here are again Parrilla (who we had to dip well into the 2016-17 season to get the 9th played event) and Charlie Pratt, who required us to go back more than two calendar years to find enough played events to qualify. Even then some top 20 players don’t have 9 events played (specifically guys like Rodrigo Montoya and Javier Mar). Issues with this system: does not reward “touring” players, over-rewards players who miss a number of events, goes back “too far” to get results in some cases. Alternative #3: Just rank based on the last 9 running events, eliminating Calendar dates. This system keeps tournaments hanging on irrespective of the date, so should address the complaints about “not having tournaments to defend points.” So to get the last 9 running Tier 1s and/or Grand Slams we just sum the points dating back to the 11/2/2017 event. However, this ranking almost exactly mirrors the Current rankings. Rocky and Landa are flipped at the top, Sebastian Franco and Samuel Murray are flipped at the 4/5 spot, and Kane is still at #6. In fact, the players in spots #7 through #18 are also identical in this system to the current 12-month rolling calendar. Why? Because all these players are playing nearly all the events, rarely missing events, and thus the point totals are basically the same. Issue with this system: Does not address the issue; Still penalizes Kane for missing so much time in early 2018. I think this is actually a pretty good ranking, taking into account results in events played plus tour event participation. Rocky is 1, Kane is 2, so Kane’s missed time penalizes him slightly but not overtly so. Its important to remember, not only did Kane miss the four events to injury in early 2018, he’s also missed four OTHER events in the last two running calendar years for various reasons. For similar reasons (missed events), both Landa and Parrilla are lower than they might be, while Beltran may be slightly higher than he should be, based on recent rankings. Issue with this system: none really for me. In this system, Rocky is #1, then Kane and Landa are tied for #2 (I put Landa 2nd because throughout all of this Landa has a number of points from non-Tier 1 events that slightly elevate his ranking over his peers). The rest of the rankings 4-20 more or less mirror the current rankings that expire points after the 365th day. I like this option too; it seems to address the issue of tournaments falling off the calendar in a rather simple way. Issue with this system: i’m not sure this system would “protect” any players besides Kane who go out with injury. Kane wins a lot of points per event played and can “make up” several tournaments worth of points for a normal tour player each time. If someone ranked in the 10-15 range missed a significant amount of time … they’d be buried in the rankings. I looked at average points earned in tournaments for each player for a one-year and two-year rolling period. The problem with using an average is that missed tournaments basically destroy the average. Kane ranks just 9th in average tourney points earned in the last calendar year, while Landa drops to 5th if you extend that average to two years. Both results do not seem valid. Conclusion: I think the simplest solution may just be to expand the system from a rolling 1-year to a rolling 2-year calendar (Alternative #4). This will smooth out periods of absence for Kane and reward a longer period of excellence overall. This suggestion also has the added benefit of representing a simple additional burden on the tour (and John Scott) to maintain. Any more complex system might be too much of a burden to maintain in an ongoing fashion. However … I do believe that the end of season rankings should only take into account the points earned in that season. It would make no sense to have last season’s results impact this season’s end-of-season rankings. So perhaps this is all just an exercise to find a better “seeding” system that does a better job of smoothing out the rankings to better indicate at any given point in time who is ranked where. I am not advocating at this time to really change the way the rankings are done for the purposes of declaring a season-ending champ. If you have different suggestions, I can run other scenarios as well. Feel free to comment or drop me a line. Another Thanksgiving weekend event happened south of the border; the San Luis Potosi Open in San Luis Potosi, Mexico. An excellent draw of the top Mexican players were there and battled it out. Thanks to Pro Kennex’ Mike Michael Martinez for getting me the draw and keeping me up to date on this event, which was one of the few non-R2sports.com driven tourneys we see these days. -#1 seed Rodrigo Montoya Solis over a qualifier (I can’t quite read his name on the draw sheet) 11,10. – Current 18U Junior World champion and #8 seed Eduardo Portillo Rendon over #9 Seed Eduardo Garay Rodriguez 14,13 (this one is available on Facebook if you follow Portillo: he live streamed it). – #7 Ernesto Ochoa, who has had a great year and has really shot up my personal rankings, beat semi regular IRT touring vet Erick Cuevas Fernandez. – #2 Andree Parrilla downed qualifier Elias Nieto 9,11. – Montoya easily beat Portillo 2,2; the 2015 Junior World 18U Champ showed the 2018 Junior World 18U champ where he needs to be. – Estrada upset Longoria 4,11. Estrada has had a number of excellent wins so far this year and continues his rise up the Mexican ranks. – Mar downed Martinez 6,12. – Ochoa beat Parrilla for the second time this year 10,14. A pretty big upset by seeds and by world ranking, but Ochoa has more than proven he’s on-fire in 2018. Parrilla made the semis of the US Open, the quarters of the IRT season opener, and pretty much is a threat to make the quarters or better now at every pro event he enters, but Ochoa was better this day. – Montoya went tiebreaker to beat Estrada (13),2,6. – Mar ended Ochoa’s run 9,3. These two met in the quarters of the Sonora Open earlier this year, with Ochoa winning en route to the title. A Great final; a re-match of the Gran Torneo Del San Isidro tourney from earlier this fall. There, Montoya got a walk-over win. Today thought Montoya won in two 9,11. Next up in Mexico should be the Abierto Mexicano de Raquetbol 2018 the second weekend of December. It was set to be an IRT-affiliated event but the two organizing bodies broke off the agreement a few weeks ago. The poster in the r2sports site shows Montoya, Waselenchuk and Longoria so i’m curious to see who shows up. … and Lambert takes the Women’s draw. 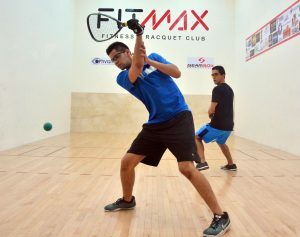 During the Thanksgiving weekend in the US, there was good racquetball being played both north and south of the border. First tourney Review: the Canadian National Singles Selection event #1. I have been capturing these Canadian National selection events, as well as Mexican Selection events into my staging data but have not loaded them to the Amateur database. Instead the Amateur database just shows the champions of the annual “National” tournaments. Especially with the Mexican selection events (which determine who has been going to international events instead of the National champs as of late), i’m debating whether to enter the data into the database since they’re top-level competitions. I’m open to suggestions. – Pedro Castro just barely squeaked by Nicolas Bousquet 15,14 in the 4/5 seed quarter; very close matches. (Note: Canada plays win-by-2, so that score isn’t a typo; final score was 17-15, 16-14). 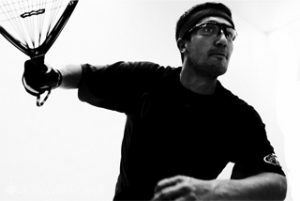 – Tim Landeryou committed Canadian racquetball fratricide, ousting his younger brother James Landeryou in the quarters. – #2 seed Coby Iwaasa took the first game off of Murray in the final before falling in a rematch of the 2018 Canadian Nationals final. Iwaasa played great at Worlds and made the final of the WRT event in Calgary last month and looks to be nearly fully returned to the scene after a 3 year layoff. – Danielle Drury took out #4 seed Alexis Iwaasa in the quarters; the sole deviation from chalk seeding in the event. – #3 seed Christine Richardson was not able to follow-up on her career amateur best result and fell in the semis. – The Ageless Jennifer Jen Saunders made the final, losing in two to Lambert. Saunders has made the final of Canada Women’s Nationals an astounding EIGHTEEN straight years, winning 10 of those 18 finals. These two results are big first steps for Murray, Lambert, Iwaasa and Saunders qualifying for the big 2019 international events. The annual Pan American Racquetball Championships of course, but the big event of 2019 is the quadrennial Pan American Games, which are including Racquetball for the 6th time in event history. Congrats to #1 Paola Longoria, who was a double winner on the weekend, taking the Singles draw over #2 seeded Samantha Salas Solis, then teaming with Salas to win the pro doubles draw. Longoria and Salas have now met in the finals of each of the season’s first four events, solidifying their lead at the top of the rankings table. Longoria improves to 46-3 against Salas on the pro tours with the win. This win represents Longoria’s 86th pro title in the database (though we may be missing some of her earlier tourney wins; a situation we’re working on rectifiying). Lastly, this tourney extends Paola’s current match winning streak to 21 games; she’s won the last 5 pro events. – Four regular touring players, coincidentally seeded 10th, 11th, 12th and 13th, were all upset in the first round of play. 4-time pro champ Cheryl Gudinas put a 5-game loss on Sheryl Lotts, then nearly beat Natalia Mendez, taking her to a 5th game tiebreaker. – Junior up and coming player Angelica Barrios took out Adrienne Fisher Haynes and took a game off of #5 seed Rhonda Rajsich before bowing out. – Michelle De La Rosa got a solid win over #10 Susy Acosta before falling in 3 closer games to #4 seed Maria Jose Vargas. De La Rosa (nee Key) has now played in 3 events this season, after playing just a handful over the past few years, and could be a force on tour if she continues to play. She’s made a number of Quarters and even one Semi and is a dangerous opponent. – Masiel Rivera Oporto played her 3rd event of the season and made her second round of 16; she’s right in the range of seeding where she could continue to get opportunistic match-ups and keep moving up the rankings. – I liked what I saw out of youngster Brenda Laime, who got past Erin Rivera before taking a game off of #2 seed Solis. – 16U world champ Valeria Centellas was one-and-done in the pro draw, running into the 7th seeded Colombian Amaya Cris, but she played very well in the Women’s Open draw, beating experienced American Sharon Jackson and then Lexi York before losing in two close games to experienced international player Adriana Riveros in the semis. – Speaking of York; she made her pro tour debut after a pretty good juniors run (she was the 2015 USA 18U champ and made the semis of junior worlds that same year). Hope to see more of York in the coming years. The quarters, semis and finals went almost perfectly chalk along the lines of seeds; the only discrepancy was #9 seeded Colombian Adriana Riveros defeating #8 Chilean Carla Muñoz Montesinos in the quarters. Neutral fans always want to root for upsets, but this tournament was missing four key names who normally would have provided some upsets to the current LPRT heirarchy. Namely, Montserrat Montse Mejia, Ana Gabriela Gaby Martinez, Frederique Lambertand Nancy Enriquez. On the doubles side, the dominant team of Longoria/Salas easily took this tourney, crushing Alexandra Herrera & Munoz 2,9 in the final. The Longoria/Salas team is now 71-3 together since we began tracking LPRT doubles in 2013. Longoria has won 36 of the 41 doubles draws she’s entered in that time, most of them won with Salas. I still can’t quite believe they were upset as a team at the 2018 Mexican selection event, thus preventing them from competing in Worlds this past summer. Next up for the LPRT: the Christmas Classic in Laurel, MD.